Duke Roufus is an American former kickboxer who is one of the top trainers in the world and head coach of the Roufusport competition team. His vast knowledge paved the way for UFC champion Anthony Pettis, along with many other rising stars in the UFC. Duke has been a coach on The Ultimate Fighter and is a popular television commentator on pro kickboxing organizations such as Glory. He is one of the most recognizable striking coaches in North America, and is considered to be one of the top trainers of Muay Thai and Kickboxing. 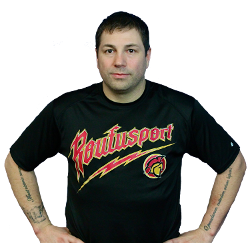 *As a member of Fight and Fitness MMA, you will also be a family member of Roufusport. You will have the opportunity to train and get ranked directly under Duke. You will not be a simple member of a local gym like most gyms, you will be part of an ever growing network of gyms around the country and world. No matter where your travels may bring you, we have a place for you to train with our fellow Roufusport family.